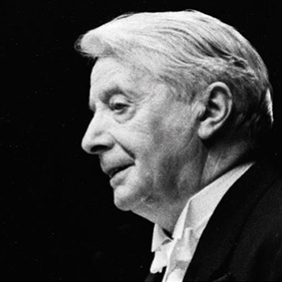 Charles Munch was without doubt one of the most emblematic figures of twentieth century orchestra conducting. He was born German in 1891 in Strasbourg (at the time part of Germany) and began playing the violin at the age of five. He studied in Paris and Berlin as well. Conscripted into the imperial army during World War One, he was gassed at Verdun in 1916. In 1919, when the Treaty of Versailles was signed, he became a French citizen, and the umlaut was dropped from the name Münch. He taught the violin at the Strasbourg Conservatory and held the position of concertmaster in the Municipal Orchestra. From 1925 to 1932, he was the concertmaster of the Leipzig Gewandhaus under conductors Wilhelm Furtwängler and Bruno Walter. It was during this period that he first tried conducting. Upon returning to France, he became the director of the Orchestre Philharmonique de Paris, which had been formed at the initiative of Alfred Cortot. After two highly successful tours in the United States, Munch became musical director of the Boston Symphony Orchestra and succeeded Serge Koussevitzky in 1949. In 1962 he returned to France, where he conducted first the Orchestre National de France and subsequently the Orchestre de Paris. He died in Richmond during a tour of the United States.